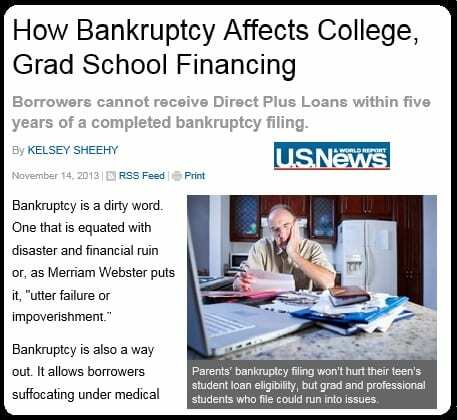 An article published November 14, 2013 by U.S. News & World Report confirms that bankruptcy has little negative effect on an undergraduate student taking our student loans and in fact might help the student qualify for up to $5,000 in additional loans if the parent is denied for a “Plus” loan. The article, “How Bankruptcy Effects College, Grad School Financing” by Kelsey Sheehy, points out that parents are ineligible to qualify for the “Plus” loan program for up to 5 years after bankruptcy. Unlike undergraduate and graduate loans taken out by students that are “need-based”, the “Plus” loans are generally taken out by parents and are a “credit-based” loan. The parent must qualify for the loan. The good news is that if the parent of an undergraduate student is denied for a “Plus” loan this can boost their child’s Stafford loan eligibility, increasing the amount awarded by as much as $5,000, according to the article. Some might read the article and draw a negative conclusion about the effect that bankruptcy might have on a parents ability to assist their child with student loans. The article correctly points out that in most cases people considering bankruptcy or already completing bankruptcy have to realize that their credit is either so poor and that is part of why they are considering bankruptcy or their debt-to-income ratio so high that in both cases they wouldn’t qualify for the loans anyway. The second point is that a generation of students and parents who are experiencing the crushing debt of student loans for a degree that might not provide a fraction of the student loan debt in annual income have realized that a much more budget-minded approach has to be taken to considering the cost of education. When trying to get orient yourself to how much you or your child should borrow to get the degree, a parent should investigate what the median annual earnings a recently graduated college student in the major from the university might receive. Student loan borrowing is easy to qualify and just as easy to abuse. Many students take out three to four time the true cost of tuition and room and board to maintain a lifestyle not in sync with their potential earnings from the degree they are pursuing. In many cases, parents who did not attend college have the same disorientation from the realities of what income their child can afford and how long it will take to pay the debt.